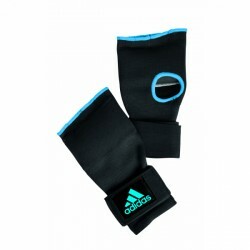 Those, who do not want to use a common boxing wrap, should use the adidas boxing wraps Gel-Knuckle. The inside glove is comfortable to wear and reduces the risk of injuries doing sparring. The hand and joint zone is additionally supported and padded for the boxing glove. The adidas inside glove is made of hard-wearing, elastic polyester and is equipped with a 4 mm gel absorption for an optimal protection of knuckles. The adidas boxing wraps Gel-Knuckle is equipped with a reinforced hook-and-loop fastener in the wrist zone for fixation.